The latter part of August saw me guiding on the other side of the mountains. Although there are some birds in the Central Valley, and I often start a day of guiding by looking for some of them, more occur where the wet forests are. That would be on the upper parts and other sides of the mountains that are visible to the north. 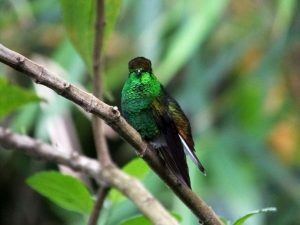 Fortunately, those cloud forests and tropical rain forests are close enough for day trips and with more than 400 bird species possible, you can bet that we see a lot. This uncommon and localized regional endemic was seen during a morning of birding at Quebrada Gonzalez. Fortunately, a male was calling and didn’t stop until we saw it. Fortunately because at first, the bird wasn’t visible. The problem with Lattice-taileds is that they are often high up in trees blanketed with bromeliads. Imagine warbler necking it up into a bunch of bushes silhouetted against a blank, cloudy sky and that pretty much describes the situation. If the bird chooses a perch behind aerial hedges at every angle, seeing it is hopeless. Well, at least until it moves. After it moved. We got much better looks than this image. 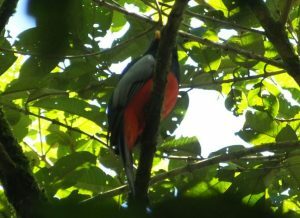 Thankfully, the male trogon kept on calling until it flew to a branch that was clearly visible along with the yellow bill and pale eye of the trogon (two of the diagnostic field marks to separate it from the Slaty-tailed Trogon). While we were looking for the trogon, a Streak-chested Antpitta beckoned with haunting whistles. Much to our great fortune, this bird too, eventually showed and gave us fantastic looks! A fairly recent addition to the foothill rainforests of Quebrada Gonzalez, it’s nice to have a somewhat reliable site for the Caribbean slope form of this bird. Most folks see it at Carara National Park but given the different song that could indicate an eventual split, it’s worth seeing this little puffball on both sides of the mountains. 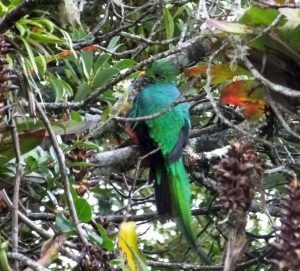 Quetzals live on the slopes of Poas but they aren’t as frequent as sites with more extensive areas of forest. The owner of the Volcan Restaurant told me that he used to see more of these fantastic dream birds up to around ten years ago. The species is still present but seeing one is always a hit or miss endeavor. Last week, we hit the jackpot when six were present at a fruiting tree! Most were juvenile males or females although one adult male was also present, and another one was calling further up the road. Seeing this mega always makes for a spectacular day of birding in Costa Rica. 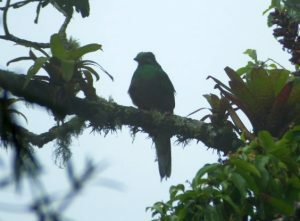 A female R. Quetzal in the mist. Connecting with this uncommon and possibly endangered skulker can be another hit or miss birding situation. 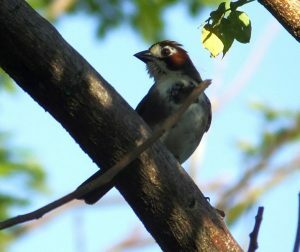 That said, I have been seeing this handsome pseudo-sparrow species on every outing. The views can be brief but we do get definitive looks at the small endemic towhee. It’s always a treat to watch various hummingbirds do their sped up thing. 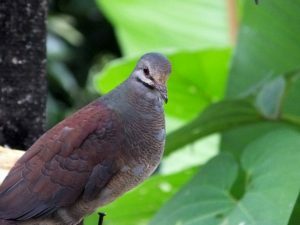 One of the most appreciated sightings was that of a juvenile Buff-fronted Quail-Dove that has been hanging out at the Cinchona hummingbird cafe for some months now. 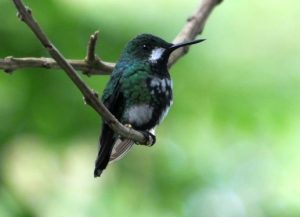 Also known as the Soda Mirador Catarata San Fernando, this classic Costa Rica birding site is a wonderful spot to sit back and be surrounded by birds while enjoying a coffee and tasty rural fare. Last week, the juvenile quail-dove bucked typical skulking behavior to jump up onto the feeder for walk away views and a memorable end to an already memorable day of birding. These were some of the choice species seen but not the only ones. Bat Falcon, Hook-billed Kite, King Vulture, tanagers, toucans, and many other species were also nice and all around an hour’s drive from the San Jose area. 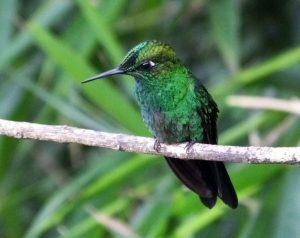 See information on where and how to find these and other birds with the 700 plus page e-book, “How to See, Find, and Identify Birds in Costa Rica“.